Fabulous modern Thai design and location make Tranquil Private Home the ideal house to live in Phuket. 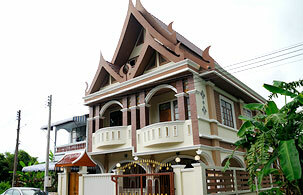 The 2 storey house has been crafted for function and style. Offering the residents a piece of mind, a convenient life, and a stylish living. On 52.50 square wah total area of land, with 280 sq.m. usable area, 'Tranquil Private Home' provides 4 bedrooms, 3 bedrooms, 1 living room, and 1 kitchen. Privately setting in a serene small village Baan Manik. Just 5 minutes drive from The Two Heroine Monument, the location gives an easy access to all island attractions and facilities.